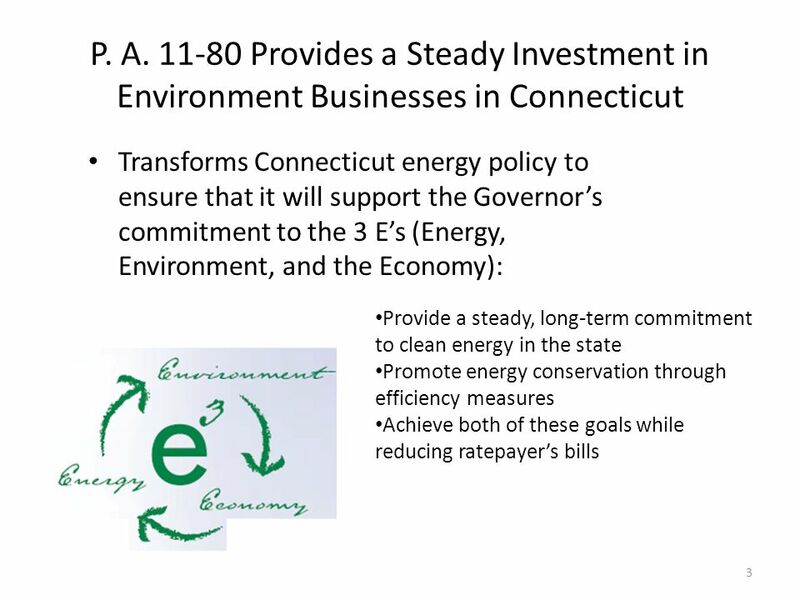 Investing in Connecticuts Energy Future Connecticuts $3b+ Long-Term Investment in Clean Energy and Energy Efficiency Over the Next Decade State of Connecticut. 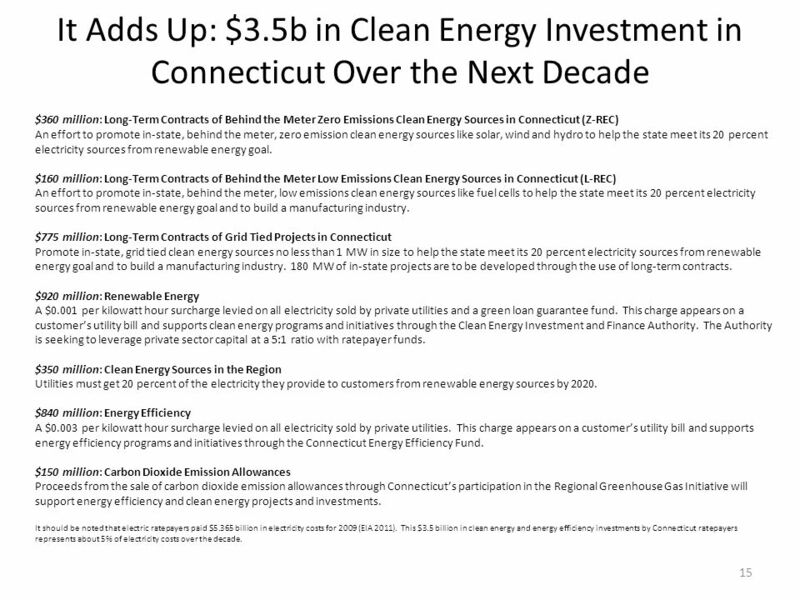 15 It Adds Up: $3.5b in Clean Energy Investment in Connecticut Over the Next Decade 15 $360 million: Long-Term Contracts of Behind the Meter Zero Emissions Clean Energy Sources in Connecticut (Z-REC) An effort to promote in-state, behind the meter, zero emission clean energy sources like solar, wind and hydro to help the state meet its 20 percent electricity sources from renewable energy goal. $160 million: Long-Term Contracts of Behind the Meter Low Emissions Clean Energy Sources in Connecticut (L-REC) An effort to promote in-state, behind the meter, low emissions clean energy sources like fuel cells to help the state meet its 20 percent electricity sources from renewable energy goal and to build a manufacturing industry. $775 million: Long-Term Contracts of Grid Tied Projects in Connecticut Promote in-state, grid tied clean energy sources no less than 1 MW in size to help the state meet its 20 percent electricity sources from renewable energy goal and to build a manufacturing industry. 180 MW of in-state projects are to be developed through the use of long-term contracts. 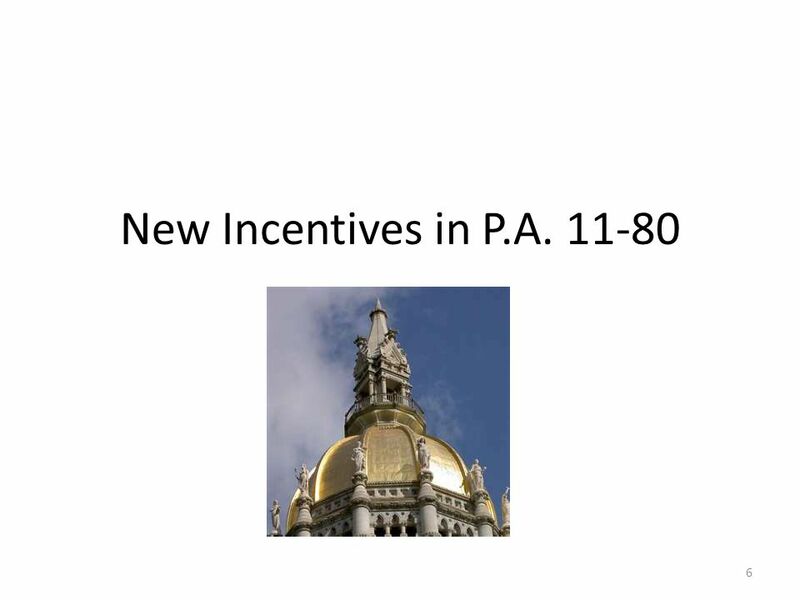 $920 million: Renewable Energy A $0.001 per kilowatt hour surcharge levied on all electricity sold by private utilities and a green loan guarantee fund. This charge appears on a customers utility bill and supports clean energy programs and initiatives through the Clean Energy Investment and Finance Authority. 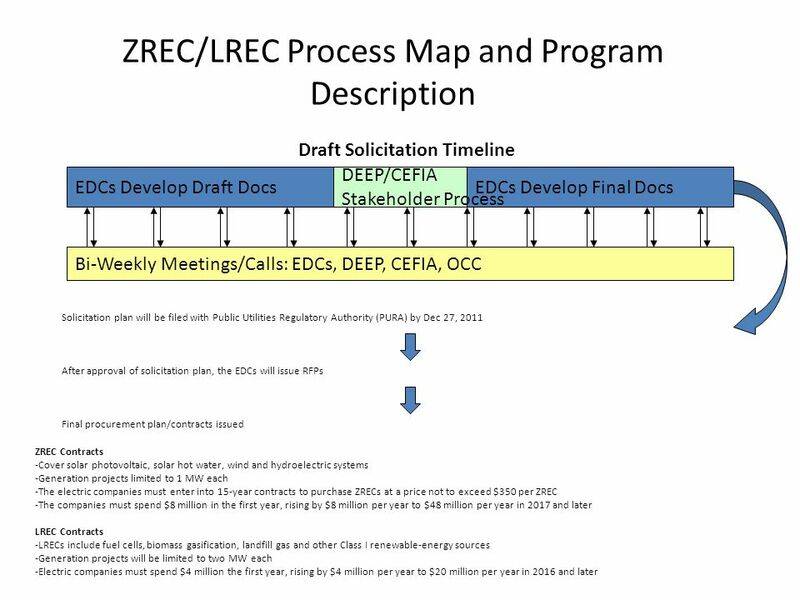 The Authority is seeking to leverage private sector capital at a 5:1 ratio with ratepayer funds. $350 million: Clean Energy Sources in the Region Utilities must get 20 percent of the electricity they provide to customers from renewable energy sources by 2020. 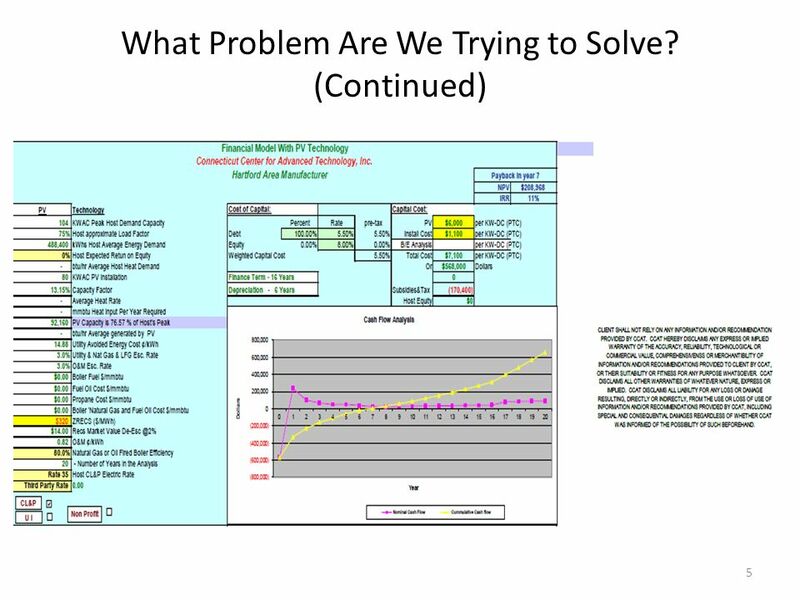 $840 million: Energy Efficiency A $0.003 per kilowatt hour surcharge levied on all electricity sold by private utilities. 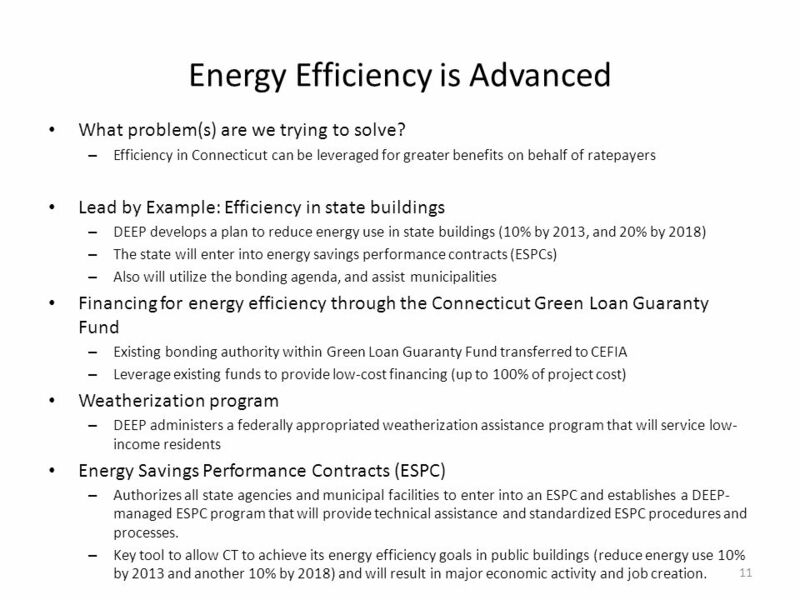 This charge appears on a customers utility bill and supports energy efficiency programs and initiatives through the Connecticut Energy Efficiency Fund. 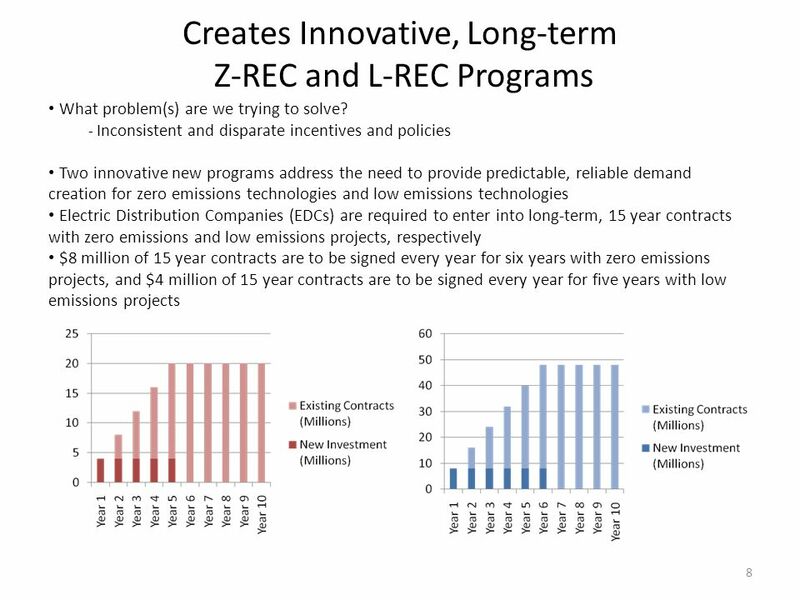 $150 million: Carbon Dioxide Emission Allowances Proceeds from the sale of carbon dioxide emission allowances through Connecticuts participation in the Regional Greenhouse Gas Initiative will support energy efficiency and clean energy projects and investments. 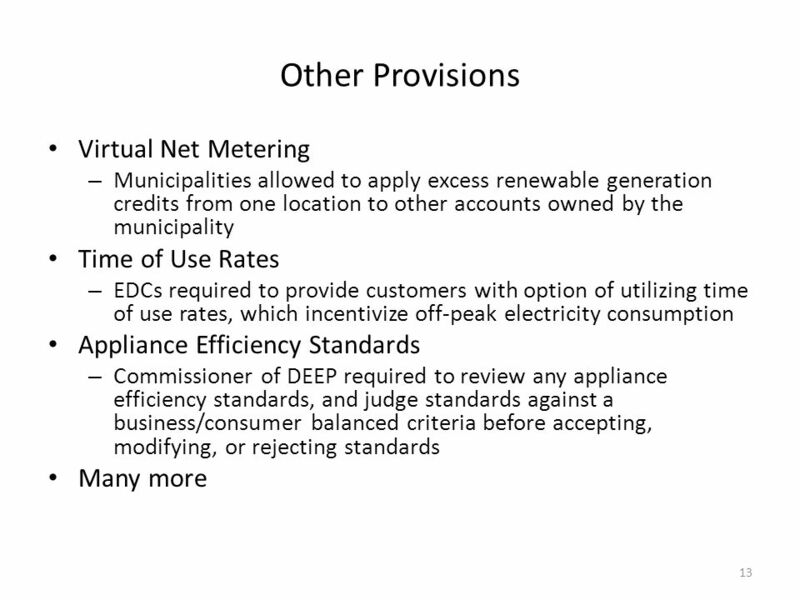 It should be noted that electric ratepayers paid $5.365 billion in electricity costs for 2009 (EIA 2011). 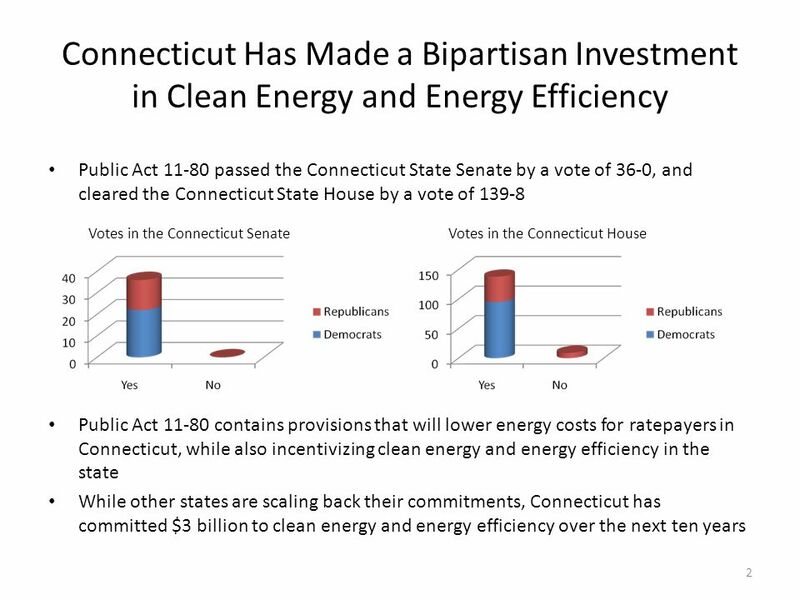 This $3.5 billion in clean energy and energy efficiency investments by Connecticut ratepayers represents about 5% of electricity costs over the decade. 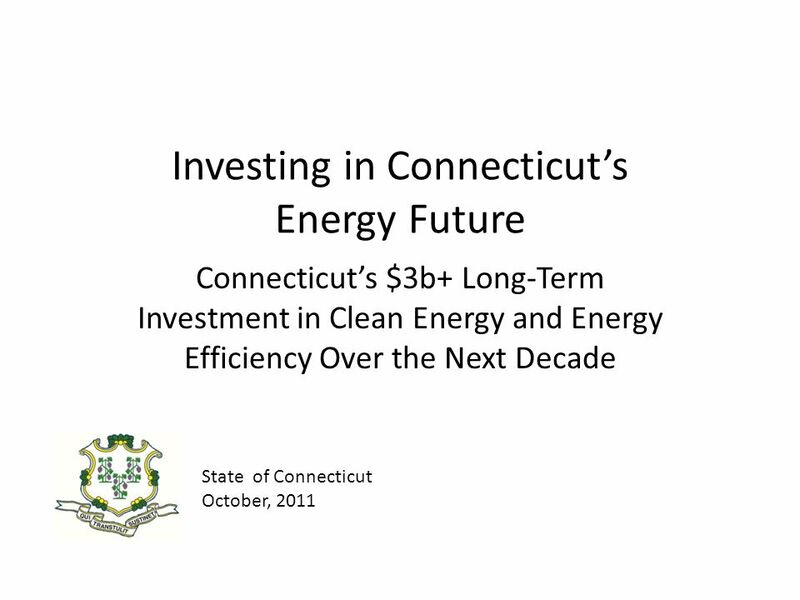 Download ppt "Investing in Connecticuts Energy Future Connecticuts $3b+ Long-Term Investment in Clean Energy and Energy Efficiency Over the Next Decade State of Connecticut." Energy Financing Energy Efficiency Philip Lowe Director General Directorate-General for Energy. FPL Proposal for a Florida Renewable Portfolio Standard FPSC Staff Workshop December 6, 2007. 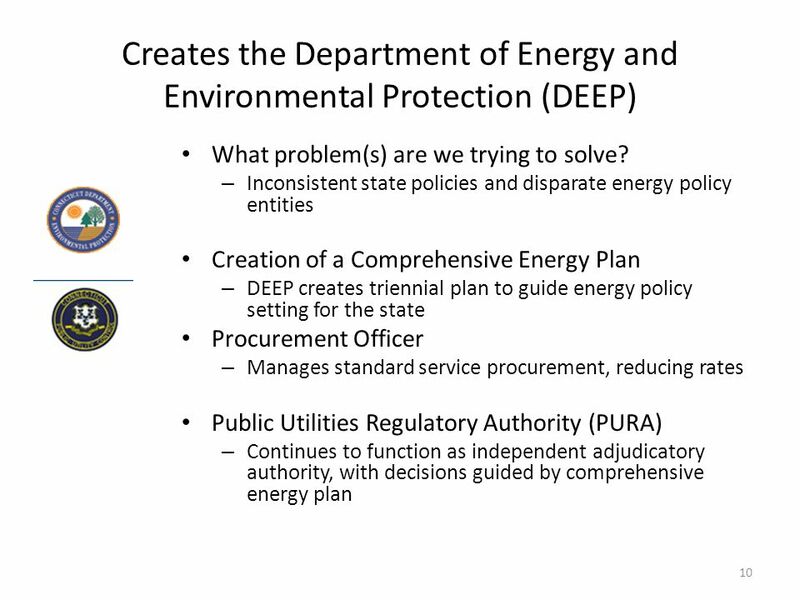 Florida Energy & Climate Commission Presentation by Timothy Jackson, P.E., AICP AECOM Design + Planning Commissioner, Florida Energy and Climate Commission. Solar Water Heating as a Green House Gas Reduction and Energy Conservation Strategy Florida Solar Energy Industries Association and Florida Solar Energy. UK enabling Legislation Renewable Energy Strategy. Technical Workshop on Tools and Measures to Inform Inclusive Green Economy Policies 2-4 July 2013 UNEP Joy A. Kim. EDISON INTERNATIONAL® SM Green Technology and Renewable Energy Opportunities 4 th Annual India Trade Conference, June 23, 2011 Cerritos CA Gary Barsley. Sustainable Energy Policies for British Columbia BC Sustainable Energy Association April 2005. 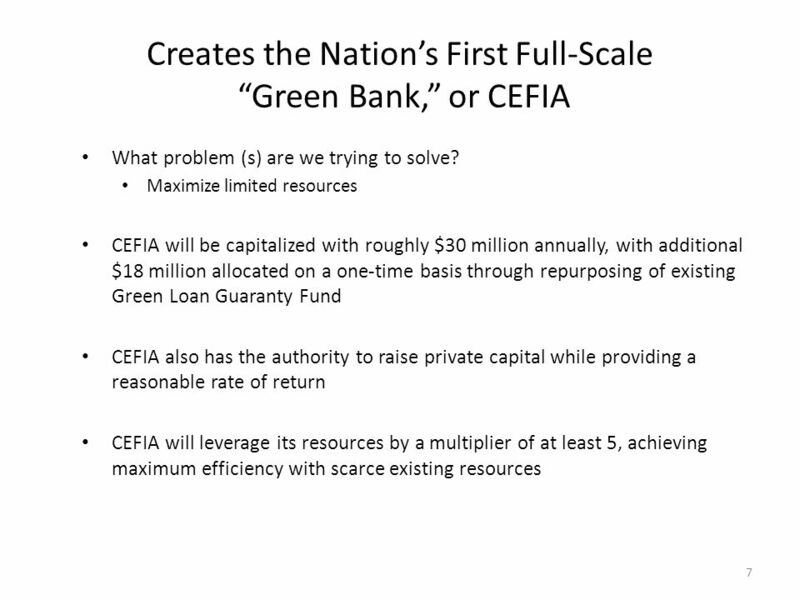 Energy Financing for Municipalities Andrew Brydges Director, Institutional Programs Clean Energy Finance and Investment Authority (CEFIA) April 2014. New Jersey Clean Energy Symposium Rowan University - June 18, 2004 New Jersey Clean Energy Program Renewable Energy Programs and Policies. 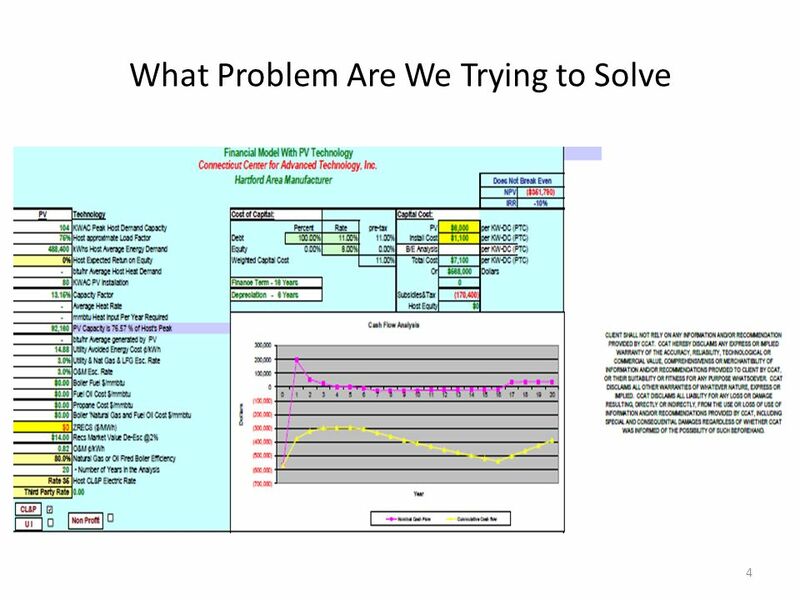 WAL-MART STORES, INC. DEMAND RESPONSE. 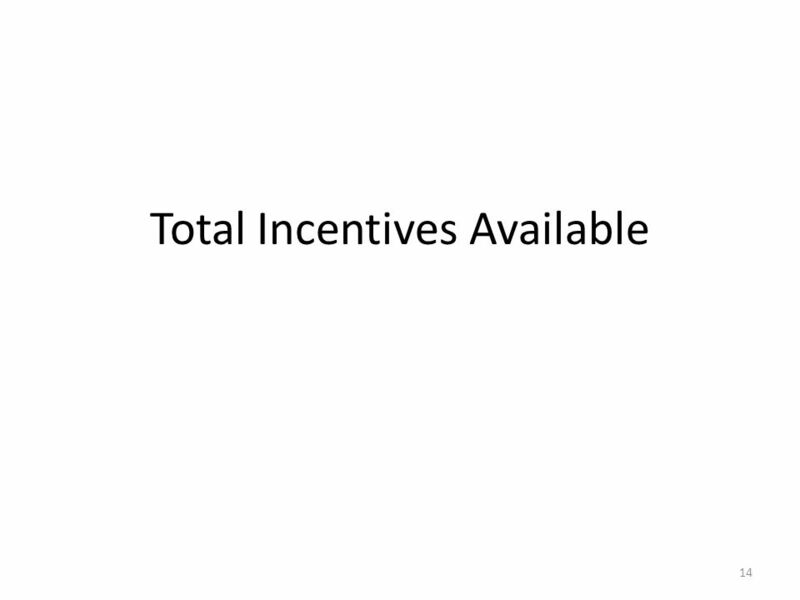 Wal-Mart in New York Supercenters45 Discount Stores45 Neighborhood Markets 0 Sam’s Clubs17 Distribution Centers4. 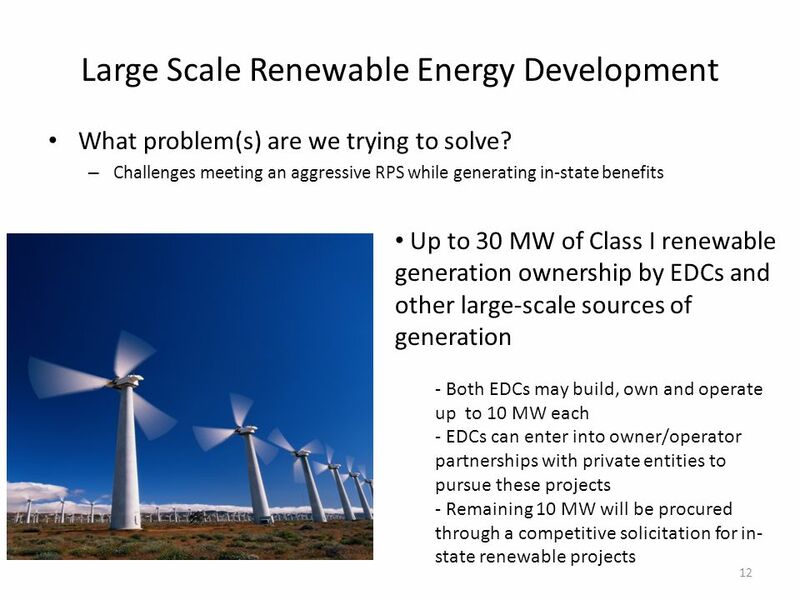 Eere.energy.gov Rebuild Hawaii Consortium – 3/5/2012 Peter Ashley DOE / EERE Presentation.